In an age of bulk-bought brisket and set-it-and-forget-it electric smokers, Buxton Hall Barbecue stands apart from the average restaurant. 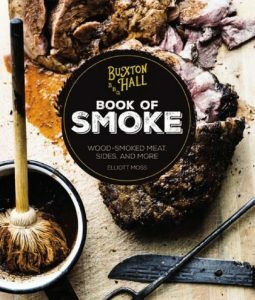 And in Buxton Hall Barbecue’s Book of Smoke, believers in slow-smoked, old-fashioned barbecue will learn how to build and master their own pit, right at home. Start small with chicken or pit beef and work your way up to a whole hog. If you’re not yet ready for the pit or limited on space, Moss also teaches easy, economical ways to infuse wood-smoke into your food. The recipes include all of the Buxton Hall favorites. Learn how to make their deep-fried smoked catfish, smoky pimento cheese, turnip soup with charred onions, or slow-cooked collards. Other recipes give the inside scoop on how a barbecue restaurant makes use of a whole hog with a waste-nothing approach: Brussels sprouts with crispy cracklin’, classic South-Carolina style hash, chicken bog, and much more. Finish the meal with Buxton’s take on classic southern desserts like banana pudding pie, grape hull pie, or s’mores with homemade marshmallows.